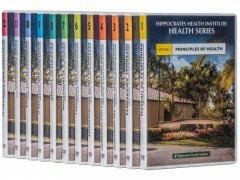 Set of 12 DVDs with lectures about the Hippocrates Health Institute Living Foods Program. A brief history of how Hippocrates came into being. A comprehensive explanation of the food groups in the Living Foods diet. 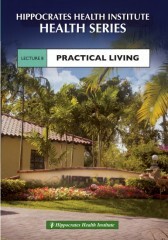 A single DVD lecture from the Hippocrates Health Institute Living Foods Program. The basics of the digestive/eliminative system and how to detoxify. Instruction in the proper way to use enemas and implants. A guide to supplements and their benefits. Also alternative options to complete the needed consumption that our human body requires. Many helpful at home healing techniques. For cuts, burns, impaired vision, infection, pre-mature gray hair; and many others. The benefits of fasting on green juice rather than water. A review of the physical, emotional, mental, and spiritual benefits of fasting. Questions on the science, psychology, and food of the Living Foods Lifestyle. The responses provide clear and thoughtful information. The workings of the elimination systems (Lymph, Liver, Lung, Kidneys and Skin) and your bodies' reactions to a detoxifying program. How to really live the Hippocrates Lifestyle when you return home. How to have what you need at home, work, and in social situations. Questions of the participants are posed. The responses provide clear and thoughtful information. The physical, emotional and spiritual healing process. How to achieve your highest goals in life. Applying the Hippocrates lifestyle at home. Proper combining of foods for good digestion. Foods that should never be eaten together. Key information for optimal health. 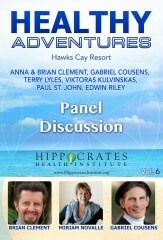 HEALTHY Adventures is a DVD series featuring a discussion board with questions and answers along with educational and therapeutic classes, seminars, and lectures from well known health advocates, Brian and Anna Maria Clement, Edwin Riley, Paul St. John, Gabriel Cousens and Miriam Novalle which took place at Hawks Cay Resort in the Florida Keys. Volume 1 contains a Welcome speech and Keynote Address presented by Brian Clement (Co-Director of Hippocrates Health Institute). During his lecture he sets the intent for the event, along with educating the audience on the importance of living a healthy lifestyle. Volume 2 explores the connection of a raw vegan diet and spirituality in Gabriel Cousens' lecture entitled "Transcendence." Gabriel, considered a spiritual master and ecological leader, has a background in Ayurvedic medicine, Chinese herbs, psychiatry, holistic and homeopathic medicine, is the founder of the Tree of Life Foundation and has written numerous books as well. Volume 3 includes a lecture given by neuromuscular therapist, Paul St. John, on the importance of body positioning and alignment. He delves into the close-knit relationship between the body's form and its function. John also demonstrates the simplicity and effectiveness of a short evaluation of the body. Volume 4 covers a lecture presented by Anna Maria Clement (Co-Director of Hippocrates Health Institute) about her Little Red Cross Box - including natural healthy alternatives. During her lecture, Anna Maria shares with the audience many simple, naturopathic alternatives that every household should contain to ensure optimal health and recovery. Volume 5 covers Miriam Novalle's lecture on The Passion of Tea in which she shares much of her tea knowledge! Dubbed by New York Times as the "Tea Guru" and is the founder and CEO of T Salon, Miriam has extraordinary skills as a perfumer and is widely known for her harmonious blends. Volume 6 includes an all-star lineup panel discussion with Anna Maria Clement, Brian Clement, Gabriel Cousens, Terry Lyles, Viktoras Kulvinskas, Paul St. John, and Edwin Riley. Together, they all discuss their take on living a raw and healthy lifestyle. Copyright © 2001-2019 Vision Earth Society All rights reserved. Web site freshly coded by Design215 Inc.